"This is a great dish that I always order whenever I go to Chinese restaurants--and wanted to try making myself. I combined and modified several authentic recipes that I found elsewhere and this is what I came up with. Present as pre-made wraps or have everyone make their own--just don't forget the hoisin sauce, it absolutely makes the dish!" Place 2 tablespoons of soy sauce, 2 tablespoons of white wine, 1 teaspoon of sesame oil, and 2 teaspoons of cornstarch in a non-reactive bowl, and stir until smooth. 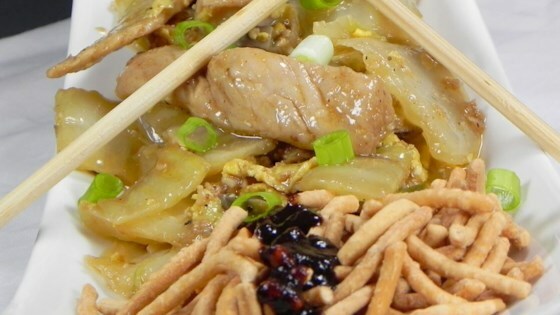 Stir the pork strips into the marinade until thoroughly coated, and refrigerate for 1 hour. Pour hot water over the shiitake mushrooms in a bowl, and allow to soften for 15 to 20 minutes. Drain, pat dry, remove any hard stem pieces, and finely chop the mushrooms. Combine the mushrooms, green onions, garlic, and ginger in a bowl, and set aside. Remove the leaves from the Napa cabbage, and tear the green leafy portions from the central stalks of the leaves. Slice the stalks the long way into thin slices, then cut them into 1-inch pieces. Finely chop the green leafy portions, and set aside the sliced stems and chopped leaves in separate bowls. In a small bowl, stir together 3 tablespoons of soy sauce, 3 tablespoons of white wine, 1/2 teaspoon of cornstarch, sugar, and ground black pepper. Set the mixture aside. Heat vegetable oil and 1 teaspoon of sesame oil in a wok over medium-high heat, and cook and stir the marinated pork until cooked through, no longer pink, and the edges have begun to brown, about 5 minutes. Remove the pork to a bowl. Pour the beaten eggs into the hot wok, adding more vegetable oil if necessary, and cook and stir until the eggs are scrambled, firm, and well-broken up, about 2 minutes. Stir in the mushroom mixture, and cook and stir 1 to 2 minutes; then stir in the Napa cabbage stem pieces. Cook and stir until the stem pieces are hot but still crunchy, about 1 minute, and then add the chopped cabbage leaves. Pour in 2 tablespoons of white wine, cook and stir the mixture until hot, about 1 more minute, then mix in the cooked pork and the reserved cornstarch mixture. Stir everything together until slightly thickened and hot, about 2 minutes. Mix the hoisin sauce, 1 tablespoon of soy sauce, and 1 teaspoon of sesame oil in a small bowl until thoroughly combined. To serve, spread about 1 tablespoon of hoisin mixture on each pancake, top with about 1/2 cup of the pork mixture, roll, and serve. Look for frozen thin Chinese pancakes (sometimes called Mandarin pancakes, duck pancakes, or moo shu pancakes) at Asian grocery stores, or substitute small flour tortillas. I love mu shu and this really hit the spot for me. Yum! I really wanted to like this.. unfortunately it tasted extremely plain despite the ingredients. sorry. no one in my family of 5 cared for it. Great dish! I made it vegetarian by replacing the pork with tofu sliced in 1 inch strips and by not using the egg. Great recipe. Thank you. I thought it was very good. I will make it again.